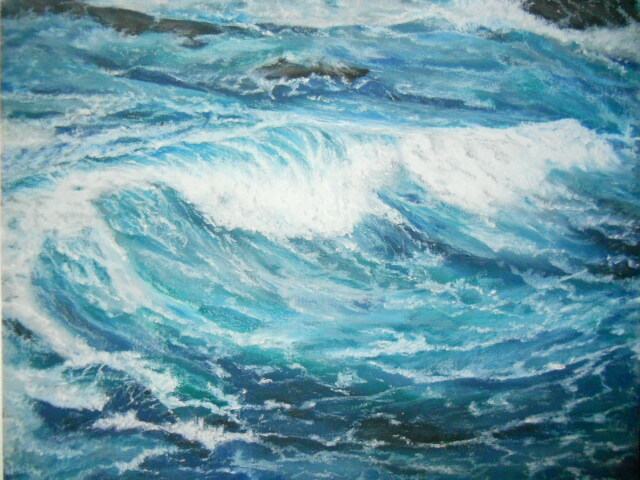 Thursday again and moving right along on the current drawing project, Storm Clouds. Sorry for how dark and blurry the image is, it’s a cloudy and overcast day so I’m unable to get a good photograph – I really tried. 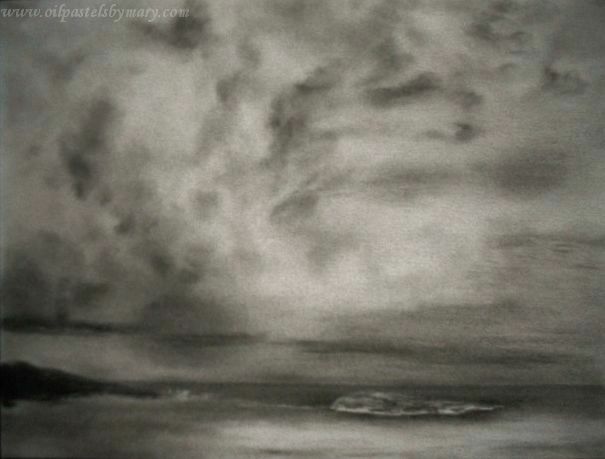 Continuing with Storm Clouds, #2 (9×12) a charcoal drawing. I’m primary using vine and compressed charcoal. Today was spent on developing the cloud mass getting an initial layer down and some darks – value control and finding patterns is what’s going to guide me the rest of the way with this scene. The clouds are the main event with this drawing, so next week will be spent building and pulling values from highlights to the darks against medium values. I love this, it’s where the rubber meets the road and I’m getting excited by what’s taking shape. Thanks for checking in . . . click onto the image for a larger view. Great subject for watching the step by step images come through, Mary. I never thought about it before, but each image you put up could be about the clouds ever-changing. I like this! Thanks Leslie – you are so right. I could watch clouds all day long, so when working out this scene changing the cloud structure was never ending. It’s been a great project to work out in charcoal – great medium for the subject. Thanks Elizabeth – stay tuned, the reveal is coming up today! Awesome! The mood is developing! I can feel the storm already Mary! Have a great weekend! Love a good storm, Mary… at least, when I’m sheltered and able to enjoy the show. Very dramatic! Thanks Steven. Hopefully the last of the drawing stages won’t disappoint! Wow – this is amazing. Thanks Nia – hope you enjoy your weekend as well, looking forward to seeing what beautiful photographs you take! Hi Mary, I love that you made the clouds the focus I love the drama you have created with your wonderful handling of darks and lights already at this stage. Looking forward to seeing your finished piece. Have a great weekend! Thanks Janell – I love working the darks against lights when the sky is the main event. Charcoal is a really cool medium to do it in, my first time doing a seascape in charcoal – hope the next few stages hold up to what I’d like to see as the end drawing. Have a wonderful weekend too! Thanks again. Love the ratio here where the sky is really the dominating part and they building up to be really heavy and loaded! Love the progress! Have a wonderful weekend Mary! Thanks Eva! Wish it wasn’t so dark out when I took the photograph, it’s looking a bit dark here. Next week will be a good photograph to post. I have some ideas to test out with this charcoal piece, hoping it gives the cloud masses a noticable 3-d feel. Thanks so much and have a wonderful weekend too! If you have any extra, please send them to California. We can use all the storm clouds we can get! Will do Audrey – I know we need that rain here in TX too! Thanks a lot! Thanks Gloria! Charcoal is a really interesting medium, you should give it a try. There’s something about these clouds that I really like. The are in the distance, but approaching … and you have a lot of activity in the clouds. Simply well done!!! … and I know you will enhance the clouds! Thanks Trini – it’s a fun scene to develop. Probably will be done next Thursday. These are looking ominous indeed, these clouds, Mary ! I would definitely be running like mad for shelter. Thanks M.R. actually it is raining way back in the horizon distance – can’t make it out now, but hopefully when it’s done.